Live the Lifestyle...Live on the Vineyard! Live the Lifestyle...Live on the Vineyard: By Leslie Kidwell, Realtor at Ocean Park Realty,. A lifestyle unique and all its own is just off the coast of Massachusetts, surrounded by the Atlantic Ocean and the Vineyard Sound. It offers everything from private waterfront retreats, the serenity of coastal living, sprawling farms, and the seclusion of up island heath land. All with arguably the most beautiful beaches and superb yachting on the East Coast. Island living offers its homeowners an upscale idyllic environment. Live on the water, live in one of our historic towns or live a rustic rural lifestyle. They are all the life on the Vineyard. 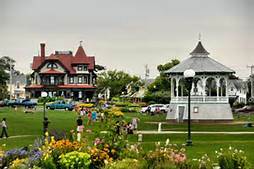 Martha's Vineyard is well known for its historic past, as well as the structures and institutions found around the island. Nestled in Edgartown harbor, are whaling captains' white homes in Greek revival and Federal styles. Arts and Culture thrive on Martha's Vineyard. Authors, painters, sculptors, dancers, and filmmakers infuse the Island communities with a vibrant cultural life. More than a dozen public galleries display an eclectic mix of work by internationally renowned and island artist. Sail, bike, golf, kayak and hike on "the Vineyard". Then dine at some of the finest restaurants on the east coast. Live the lifestyle...live on the Vineyard.